The Western genre’s recent unimpressive box-office history hasn’t deterred Joel and Ethan Coen (A Serious Man, No Country for Old Men, The Big Lebowski, Fargo) from wading into the genre and making their own. 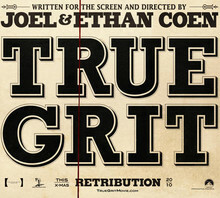 True Grit is the duo’s adaptation of Charles Portis’ 1968 literary Western that was initially adapted as a movie-star vehicle for John Wayne in 1969. The new film opens on a lyrical shot on a snowy night as a man lies dead outside a boarding house in Fort Smith, Arkansas. The dead man’s daughter, Mattie (Hailee Steinfeld), arrives to make funeral arrangements, but stays when she discovers the sheriff won’t pursue the drifter, Tom Chaney (Josh Brolin), who murdered her father. After obtaining the return of her father’s money from a horse dealer, Colonel Stonehill (Dakin Matthews), her search for a man with “true grit” ends when she finds Rooster Cogburn (Jeff Bridges), a grizzled, pot-bellied, hard-drinking U.S. Marshal. Marshals supplemented their income with reward money for tracking down fugitives dead or alive. After Mattie wears Cogburn down, he attempts to leave her behind in Fort Smith, but Mattie refuses to relent and accept the gender and age limitations Cogburn wants to impose on her. A self-aggrandizing Texas Ranger, LaBoeuf (Matt Damon), joins the search for Chaney. He wants to bring Chaney back to Texas for the murder of a Texas state senator. The reward money for Chaney’s return to Texas is significantly higher than Mattie’s offer, creating conflict between Mattie, LaBoeuf, and Cogburn as to what they’ll do when (and if) they capture Chaney. For their adaptation, the Coen Brothers went back to Portis’ novel, shifting the emphasis back to Mattie, the central character and narrator. They also retained Portis’ florid, archaic dialogue, which was modernized and smoothed out in the 1969 adaptation. Regardless of educational background (or lack thereof), every character speaks in mock-comic, deliberate declamations, a challenge to experienced actors like Bridges and Damon, but more so for a newcomer like Steinfeld. But Steinfeld is nothing short of revelatory, imbuing Portis’ dialogue with natural emotion and nuance. True Grit turns, like most Westerns, on frontier justice and frontier violence (often, but not always identical). Mattie wants justice for her father’s murder, but given the realities of frontier life (i.e., large, under-populated territories, minimal law enforcement), it’s unlikely. When she turns to Cogburn, it’s out of desperation. Cogburn may be a U.S. Barshal, but he’s nothing like the contemporary professionals who bear the title. By his own admission, he’s been on both sides of the law, but it’s proficiency with a gun and his proficiency in killing that led him to become a U.S. Marshal. True Grit received a PG-13 rating from the MPAA — a rarity for a Coen Brothers film, suggesting that they have mellowed as they enter their fourth decade as filmmakers. 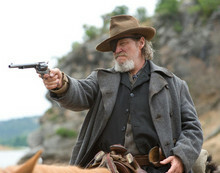 That aside, True Grit is the equal of the Coen Brothers’ best work with more, hopefully, to come.